Genoa is the most important city on the Italian Riviera and probably the best starting point in exploring the breathtaking shores in the region. It’s just an hour away by train from famous destinations like Cinque Terre and Portofino. Its position as the European Capital of Culture in 2004 have made the birthplace of explorer Christopher Columbus an enticing place which is gradually becoming more included in the touristic market. • The Old Port - Porto Antico is home to a number of fascinating monuments, from the harbour itself to the huge lighthouse which dominates the seafront. One of the city's most interesting modern landmarks, Il Bigo, lifts visitors high into the air to get a better view of both the city and the sea. • The Aquarium in the Old Port is an absolute must see. 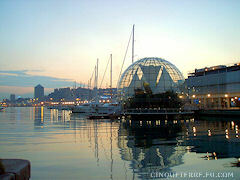 This is the biggest aquarium of Europe and will keep you interested for hours. It even provides a hands-on experience with tactile pools where you can reach out and pet rays as they swim by or simply bask in the shallows. Look out for the sharks, giant turtles and luminous showers of floating jellyfish. • The Old Town - Centro Storico, which is the biggest of its kind in Europe, is full of huge and decorated buildings from the Middle Ages, which were built by the wealthy trader families of the city. The atmospheric streets of the medieval Old Town of Genoa are listed as UNESCO world Heritage Site, and the city also has several beautiful historical palaces and cathedrals. • Duke's Palace - Palazzo Ducale is probably the most wellknown building of Genoa, because the international G8 meeting took place in the building in 2001. 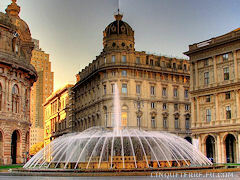 It is situated near the main square Piazza de Ferrari, and consists of two palaces, merged in the 14th century. • San Lorenzo Cathedral in Piazza San Lorenzo was built about 1098 then widened. The San Lorenzo cathedral is dedicated to San Giovanni Battista, city patron and hosts two beautiful Museums: Museo del Tesoro and Museo Diocesano.